Elegant Chivari chairs are the perfect way to upscale your event. At Cooke Rentals, we include a cushion and cushion cover in your choice of White, Ivory, or Black with each chair rental! 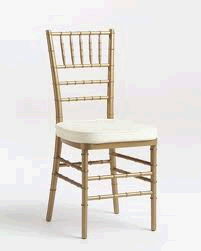 * Please call us for any questions on our chair chiavari gold rentals in Cornelius NC, Lake Norman, Mooresville, & Davidson, North Carolina.